Attachment refers to the emotional bond that we share with others. It "may be defined as an affectional tie that one person or animal forms between himself and another specific one – a tie that binds them together in space and endures over time" (p. 50, Ainsworth & Bell, 1970). It is an area of interest to developmental psychologists as research evidence shows that a child’s early attachment to their caregiver(s) significantly influences their ability to manage their feelings and behaviour, acquire the skills necessary for successful emotional/social functioning, relate to others and maintain social and emotional relationships. Attachment theory was first proposed by John Bowlby (1907-1990). The theory suggests that our early experiences of relationships significantly affect our emotional and social development, and our ability to form relationships with others throughout our lives. Bowlby argued that there is a biological and evolutionary basis to attachment. He believed that infants are predisposed to forming a strong emotional bond with a particular person because it aids their survival; the caregiver provides nurture, protection and security. Bowlby argued that children also have a tendency to explore and play in the environment around them. This desire to explore allows the infant to experience things away from the caregiver, so long as they are still in sight. However, when the child becomes completely separated from the caregiver, is distressed (e.g. due to an injury or illness) or when a stranger enters the situation the child will exhibit proximity-seeking behaviours in an attempt to restore physical closeness with, and seek security and comfort from, the caregiver. The quality of a child’s attachment to their caregiver(s) is influenced by their early experiences of being parented; the caregiver’s behaviour directly influences attachment development. Secure attachment develops when the caregiver(s) respond sensitively, consistently and appropriately to the child’s needs. Therefore, the securely attached child sees their caregiver as being trustworthy and dependable. They also view themselves as being worthy of their care, resulting in them feeling secure in themselves. The child learns about the reciprocity of social interactions and develops social skills that can be used in future relationships. When a parent is not sensitive, consistent and appropriate in their caregiving this secure attachment does not develop and the child is said to be ‘insecurely attached’ and this crucial process forms a sort of blueprint for social interactions. Poorly met needs or poor communication between caregiver and child can lead to an inconsistent, underdeveloped, or chaotic blueprint, ultimately affecting how they respond to adults, other children and environmental stimuli. In some cases children that are subject to Adverse Childhood Experiences or Developmental Trauma, which can impact widely upon their ability to establish and maintain relationships of all sorts. Research suggests that children with a secure attachment style demonstrate improved social competence, higher quality relationships, improved coping and self-regulation, higher self-esteem, increased independence and self-reliance, better academic outcomes and fewer behavioural and psychological difficulties (compared to children with an insecure attachment style). Insecure attachment is generally associated with poorer outcomes than secure attachment. Insecurely attached children are more likely to develop externalising behavioural problems (such as aggression, defiance and hyperactivity) and demonstrate lower resilience. Insecure attachment is also associated with immature emotional and social functioning, poorer language development and weaker cognitive, executive functioning skills (such as working memory, planning and organisation skills, self-control). They have difficulty in regulating their responses when experiencing stress, the more likely the child will exhibit survival behaviours: a fight, flight or freeze response due to a distorted blueprint. In these situations, supporting the child can take a counter intuitive approach. A large proportion of children are insecurely attached (approximately 40%; Moullin, Waldfogel & Washbrook, 2014) therefore every classroom is likely to have insecurely attached children. Bergin and Bergin (2009) argue that educators can play a significant role in improving the outcomes for insecurely attached children by forming secure relationships with them. Although a child may be insecurely attached, changes to their emotional and social experience will allow them to feel secure. Insecurely attached children are more likely to achieve similar outcomes to a securely attached child if they are helped to feel secure in school. Teachers, in particular teachers’ relationships with children, play a crucial role in achieving this. At Beech Lodge School, we look at a pupil's development rather than just purely grouping them with children of a similar chronological age range, realising that many of our pupils have been affected by Adverse Childhood Experiences, which may lead to immature functioning in various social and emotional domains. We do not separate the behaviour from the child but see a behaviour as an expression of the child's state of mind. Click here to view some typical behaviours that can been seen in pupils that have attachment difficulties along side what needs they are trying to communicate and what you can do to help them at school. This must come before any intervention, scrip or reward system. The most effective way to support these children is to develop positive attachments and relationships with them. The system that is used is less important than the adults delivering it. Bergin, C., & Bergin, D. (2009). Attachment in the classroom. Educational Psychology Review, 21(2), 141-170. Moullin, S, Waldfogel, J & Washbrook, E. (2014). Baby bonds: Parenting, attachment and a secure base for children. London: The Sutton Trust. The term 'Developmental Trauma' is now used to describe childhood trauma such as chronic abuse, neglect or other harsh adversity in their own homes. When a child is exposed to overwhelming stress and their caregiver does not help reduce this stress, or is the cause of the stress, the child experiences developmental trauma. These children are at risk for a host of complex emotional, cognitive and physical illnesses that last throughout their lives. 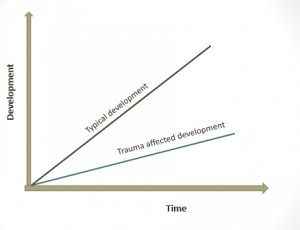 Developmental traumas are also called Adverse Childhood Experiences. These are chronic family traumas such as having a parent with mental illness or substance abuse, losing a parent due to divorce, abandonment or incarceration, witnessing domestic violence, not feeling loved or that the family is close, or not having enough food or clean clothing, as well as direct verbal, physical or sexual abuse. The impact of these traumas has been researched extensively. One such body of evidence comes from a database of over fifteen thousand adults, in a now-famous study known as the Adverse Childhood Events (ACE) study. The national movement around Adverse Childhood Experiences has helped to reinforce the message that children’s early experiences impact significantly on their later outcomes, and has been further developed by the growing field of neuroscience. This renewed focus is welcome as it has moved the conversation on for many from ‘what is wrong with this child’ to ‘what has happened to this child’. However, it is essential that those involved in education are able to see the links between this and approaches that are already established within education such as child development, attachment theory and whole school nurturing approaches. One of the important messages for educators is the idea that relationships can mitigate against negative outcomes - both within the home and community context and the school context. Learning how to cope with adversity is an important part of healthy childhood development. It is only when stress is prolonged and occurs without the buffering effect of protective relationships, that it can lead to a stress response or reaction that can become more toxic over time. Consequently, schools need to develop a relationship based approach to support the wellbeing of all young people, but particularly those who have experienced adversity without these protective relationships.